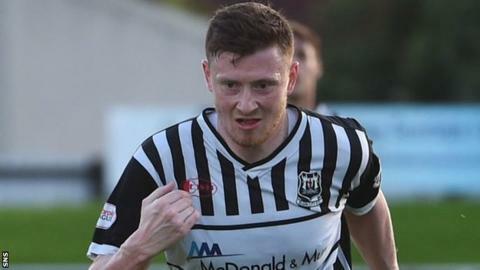 Edinburgh City moved off the foot of Scottish League Two as Elgin City overtook Clyde into second place. In a reduced fixture card due to Scottish Cup ties, Edinburgh beat Arbroath 1-0. Elgin City were 4-1 winners at home to 10-man Montrose and profited from Clyde's 1-0 loss at Cowdenbeath. Annan Athletic and second-bottom Stirling Albion were in cup action while leaders Forfar Athletic and Berwick Rangers did not play. Fourth-placed Arbroath sustained a first defeat in 10 matches after Ouzy See's close-range shot gave Edinburgh their third league win of the season. At Borough Briggs, Montrose found themselves down to 10 men after only six minutes with Terry Masson sent off for a foul on Archie MacPhee. However, it took Elgin until the second half to make their numerical advantage count, MacPhee striking low into the net. Chris McLeish netted from close range and Shane Sutherland also fired home before Michael Bolochoweckyj's shot replied for the visitors. Brian Cameron struck Elgin's fourth late on. At Central Park, Cowdenbeath and Clyde were locked at 0-0 until the 86th minute, when Kris Renton headed what would be the hosts' winner. Elgin and Clyde are level on points but a superior goal difference puts Jim Weir's men ahead, with both teams five points behind a Forfar side that has two games in hand.